MX-4 is a bright and powerful scanner with a 150W discharge 6000 hour lamp. Using an ultra-fast strobe effect and individual color and gobo wheels it is the perfect choice for today's cutting edge DJs. 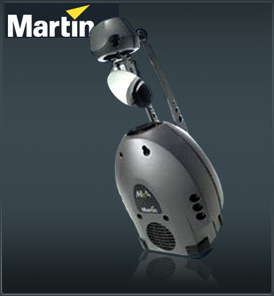 The MX-4 is an automated profile spotlight that employs a long-life 150 watt discharge lamp. It provides 15 full and 2 split colors, 19 gobos, high-speed shutter, 230° of pan and 76° of tilt, adjustable focus, and a 16° beam angle. It may be operated with DMX controllers, the Martin MC-1 remote control, or as a stand-alone unit with master/slave capability. The luminaire shall be an automated 150 watt profile spotlight with moving-mirror, color filters, gobos, and mechanical shutter. The luminaire shall be the Martin MX-4. The luminaire shall provide two overlapping wheels for the insertion of color filters and gobos. The first wheel shall provide 15 monochrome filters, two multicolor filters, and an open position. The second wheel shall provide 19 gobos and an open position. The luminaire shall block light output and provide flash effects at speeds up to 13 flashes-per-second by means of a mechanical shutter. The mirror shall pan 230° and tilt 76.5°. The luminaire shall respond to command signals conforming to the USITT DMX512 (1990) standard and shall have locking 3-pole XLR connectors for input and throughput of serial data. The luminaire shall be constructed of sheet steel and aluminum. The covers shall be constructed of a UV-resistant fiber-reinforced composite material with integral black color. The finish of the covers shall natural black or an applied titanium color polyurethane coating. The luminaire shall operate in any orientation. It shall have a mounting bracket with a dedicated mounting point to which a mounting clamp may be bolted. When installed above floor level, a means of secondary attachment shall be employed. The luminaire shall be capable of operation on 50 and 60 Hz supplies at 100, 120, 210, 230, and 250 volts, plus/minus five percent. It shall be fitted with a three-prong male IEC socket for connection to AC power. The luminaire shall be electrically grounded. The luminaire shall conform to CE safety standards EN 60598-1 and EN 60598-2-17, and to CE electromagnetic compatibility standards EN 50 081-1 and EN 50 082-1. The luminaire shall conform to CSA standard C22.2 No. 166 and ANSI/UL standard 1573. Size: 537 x 269 x 263 mm (21.1 x 10.6 x 10.4 in.). Weight: 8.8 kg (19.4 lbs).